Click on a practice paper above to access the questions ready formatted to be printed on one sheet of A4 paper (double sided). Subscribers have access to worked solutions for each of the questions via links at the bottom of each of the practice papers. The links do not appear on the printed versions of the papers. A time of 30 minutes has been suggested for each of the papers (except for the last Practice Paper) so that they could be done as a part of a lesson or assigned for homework. This amount of time will be more generous for some papers than others so don't read too much into the time limit. The papers are designed to help you (or your students) prepare for the GCSE Mathematics examinations which were set for the first time in 2017. A printable progress record sheet for the first 20 papers is available here. The more common formulae are no longer given in the exam paper. Here is a Formulae Sheet to memorise. Comparison of statistics for new GCSE examinations in June 2017. "An informative newspaper article in the Ipswich Star explained the nine to one grades just before the first set of results were announced. Four is a 'standard pass', equal to a low C. Five is a ‘strong pass’, equal to a high C, and is the new benchmark. 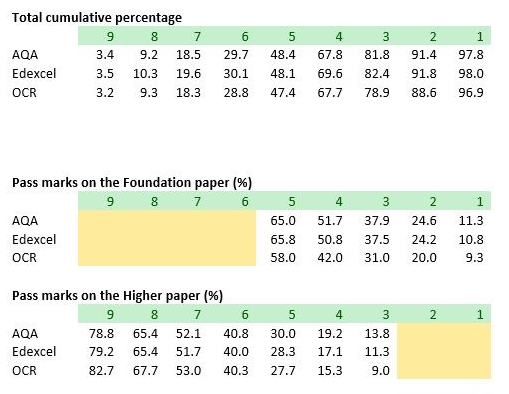 Seven to nine is equal to A and A*. Three to one is equal to D to G.
You can read the full article in the Ipswich Star."